Cabin and Lodge holiday theme, by The Weed Patch. Rustic cabin in the woods, wool sweaters and blankets, camping supplies, skiing, and fishing. A warm and rustic palette of traditional reds and greens, with pinecones, tartans, trees, moose, bear, and more! Has a weighted base for sitting securely on a shelf, and button/bead legs that dangle. Measures approx 13 inches. 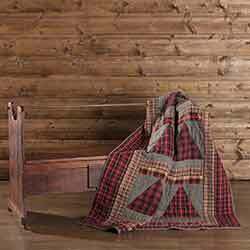 Features alternating patches of cherry red, iron grey, and marshmallow plaid on the herringbone weave felt, the Anderson Patchwork 48 inch Tree Skirt is perfect for a cabin or nordic look. 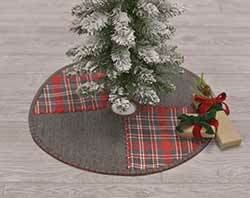 Features alternating patches of cherry red, iron grey, and marshmallow plaid on the herringbone weave felt, the Anderson Patchwork 55 inch Tree Skirt is perfect for a cabin or nordic look. 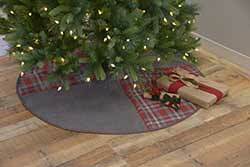 Features alternating patches of cherry red, iron grey, and marshmallow plaid on the herringbone weave felt, the Anderson Patchwork 60 inch Tree Skirt is perfect for a cabin or nordic look. Features alternating patches of cherry red, iron grey, and marshmallow plaid on the herringbone weave felt, the Anderson Patchwork Mini Tree Skirt is perfect for a cabin or nordic look. The Anderson Plaid 48 inch Tree Skirt features classy cherry red, iron grey, and marshmallow textured woven plaid, for a timeless holiday look. 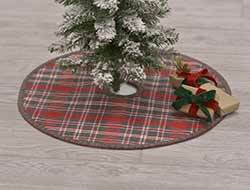 The Anderson Plaid 55 inch Tree Skirt features classy cherry red, iron grey, and marshmallow textured woven plaid, for a timeless holiday look. 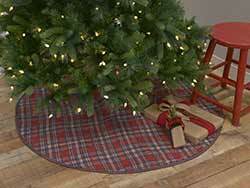 The Anderson Plaid 60 inch Tree Skirt features classy cherry red, iron grey, and marshmallow textured woven plaid, for a timeless holiday look. The Anderson Plaid Mini Tree Skirt features classy cherry red, iron grey, and marshmallow textured woven plaid, for a timeless holiday look. 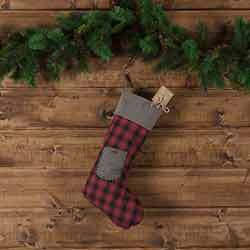 The 12x20 Andes Stocking features a plaid base, grey chambray pocket with thick whip stitching, turned chambray cuff, and hanging loop. With solid and plaid triangle patches reminiscent of a mountain range, the Andes Quilted Throw builds on winter themes with rustic overtones. Animal Ornament with Chalk, by the Abbott Collection. Have fun with this chalkboard ornament by personalizing it however you want! 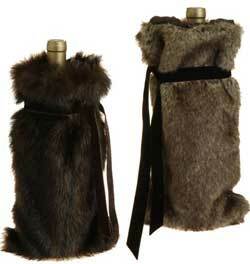 Great as a hostess gift around the neck of a bottle of wine. Comes with a piece of chalk. 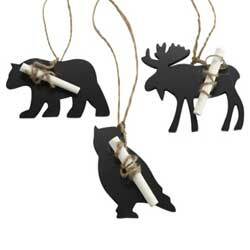 Sold individually - Choose the Bear, Moose, or Owl Ornament. Measures 4 inches. Made of wood. 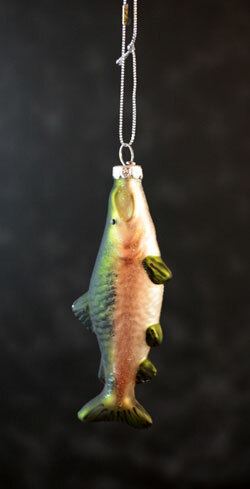 Bass, Pike, or Walleye Ornament, by Seasons of Cannon Falls. Wood fish ornament with collage image. 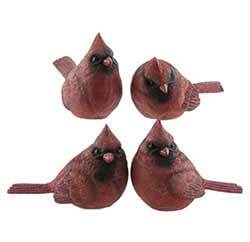 Sold individually from the three in photo - Choose the Bass (left), Walleye (Middle), or Pike (Right) Ornament. Part of the Winter Pine Collection. Measures 5.75 x .25 x 2 inches. Made of wood. 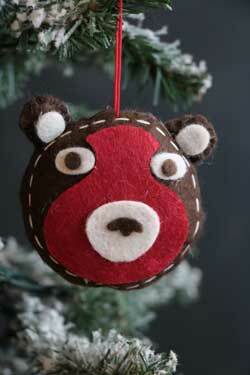 Bear Felt Ornament, by Seasons of Cannon Falls. Darling sewn felt pillow ornament in the shape of a woodland animal! In a red, white, and grey/brown color palette. This is for the BEAR ornament. Part of the Livin Lodge Collection. Measures 3 x 1.5 x 4 inches. Made of felt. Start your tradition this holiday season with this custom hand painted ornament on a hand-cut wood slice. 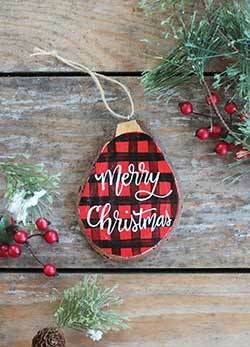 Features hand painted black and red buffalo plaid pattern, and hand lettered "merry Christmas." Burlap Brown Wine Bag, by Nancy's Nook. The Burlap Collection is a soft, cotton woven burlap adding a natural look that coordinates beautiful with almost any decorating style, available in 4 colors. 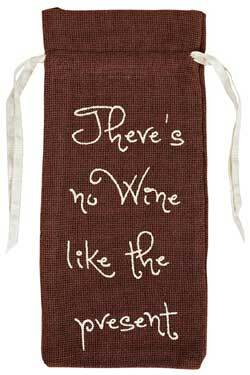 This is for the Wine Bag, which reads: There is no wine like the present. Measures approx 13 x 6.5 inches. 100% cotton. Machine washable. Coordinates many other Victorian Heart Collections! Other pieces also available. Burlap Tree, by Hanna's Handiworks. Winter tree made of stitched and stuffed green burlap, with red yarn ornament. Sold individually from the three shown - Choose the Small, Medium, or Large Tree. Measures approx 10-12"W x 16-24"H x 3-5"D. Made of dyed jute fabric, red yarn, and resin base, intentionally distressed for an aged look. 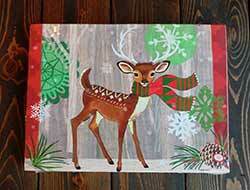 The Cabin Christmas 48 inch Table Runner features stenciling reminiscent of rustic villages found in the Swiss Alps along each side. Perfect for nature and gardening lovers, our resin birds are great for spring decorating, nature home accents, adorning indoor plants or bird's nests, etc. This is for the Cardinal. Chalet Bird Ornament, by Tag. 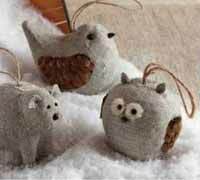 Gray fabric bird ornament with natural pine cone details. Part of the Chalet Collection. Measures 2.75 x 3.5 x 2.75 inches. Chalet Owl Ornament, by Tag. 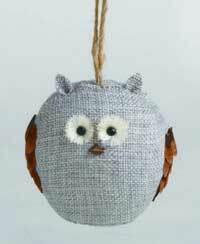 Gray fabric owl ornament with natural pine cone details. Part of the Chalet Collection. Measures 2.75 inches. Christmas Deer Light Up Canvas Wall Decor, by Raz. Add some color and pizazz to your walls this winter season with this beautiful deer canvas art print! Great for all winter long, a woodland or cabin look, etc. Pretty as is, but it also lights up! Christmas Foliage Tree, by Hanna's Handiworks. Lovely tabletop tree with faux greenery sprigs, natural pinecones, red berries, snowy glitter, and burlap holly leaves, with a weighted, burlap wrapped base. Decorate with ornaments, or just leave as is! Stands about 30 inches tall (more than 2 feet! ), and is about 12 x 15 inches wide/deep. Come compressed for shipping, you'll have "fluff" out the branches and sprigs to your liking. Christmas Owl Light Up Canvas Wall Decor, by Raz. 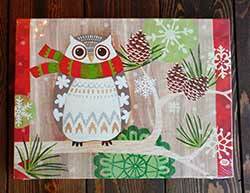 Add some color and pizazz to your walls this winter season with this beautiful owl canvas art print! Great for all winter long, a woodland or cabin look, etc. Pretty as is, but it also lights up! Coho Salmon Ornament, by Seasons of Cannon Falls. Part of the Glassworks Collection. Measures 1.5 x 1.5 x 4.5 inches. Made of glass. 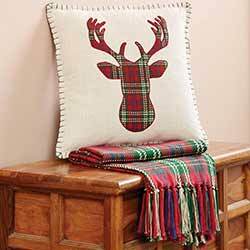 The Connor Deer Pillow is an ideal piece to decorate holiday themed seating area. 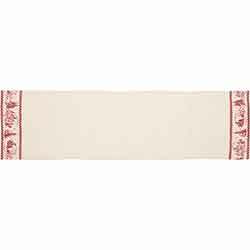 An appliqued deer silhouette in woven plaid is displayed over a soft eggshell slub weave for a wonderfully unique look complete with a whipstitch border. 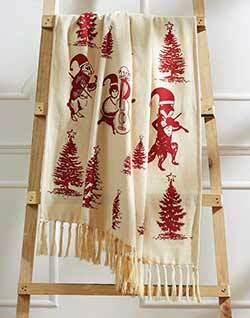 Creature Carol Woven Christmas Throw, by VHC Brands. 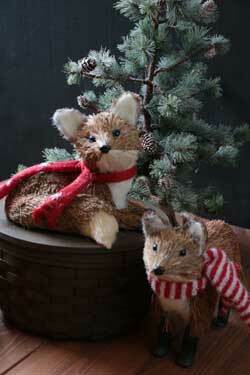 Features a darling pattern of woodland animals and trees in a brick red and cream palette. Accent a sofa, wall, or even tabletop, or give as a gift! Sold individually - Choose the Bird on the Left or the Right. Crimson Plaid Penguin, by Hanna's Handiworks. 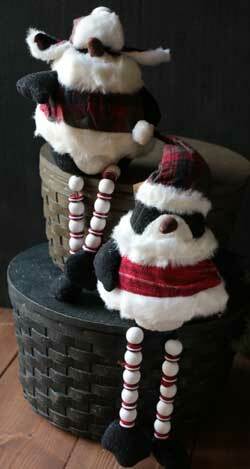 Adorable stuffed penguin decor for your shelf, mantel, or under your Christmas tree. Perfect for the country or woodland cabin look, wearing plaid in black, red, and grey! Sold individually - Choose the Bird on the Left with the stocking had, or the Right with the Earflap hat. Sold individually - Choose the Bird on the Left or the Right. Measures 5½"W x 12½"H x 4"D (inches). 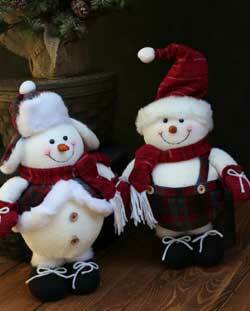 Sold individually - Choose the Snowman on the Left or the Right. Deer on Base, by Raz. 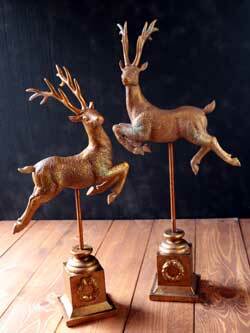 Elegant leaping deer on base in an antiqued gold color, distressed for a vintage look, accented with a little bit of glitter. Great accent for a mantel or side table! Part of the Pheasant Collection. Set includes one of each deer figure shown. Left measures 21 x 10 inches, Right measures 25 x 11 inches. Made of resin. Simple assembly required. 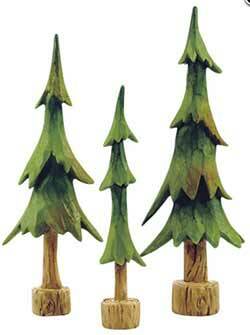 This set of three mini evergreen trees pairs wonderfully with our other miniatures, such as log cabin, moose, snowmen, etc. 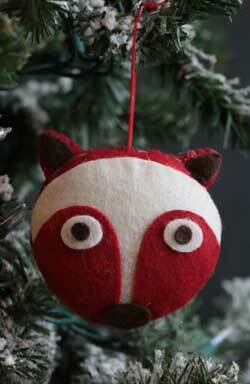 Fox Felt Ornament , by Seasons of Cannon Falls. Darling sewn felt pillow ornament in the shape of a woodland animal! In a red, white, and grey/brown color palette. This is for the FOX ornament. Part of the Livin Lodge Collection. Measures 3 x 1.5 x 4 inches. Made of felt. Fox Figure, by Raz. Sold individually - Choose the Standing or Sitting fox figure. Part of the Owl Be Home For Christmas Collection. Measures 8.5 X 13 and 7 X 9 inches. Made of grass and polyfoam. 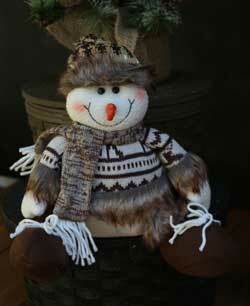 Stuffed figure in a woody brown and white color palette, with faux fir trim. This is for the SANTA CLAUS. Furry Snowman Figure, by Hanna's Handiworks. 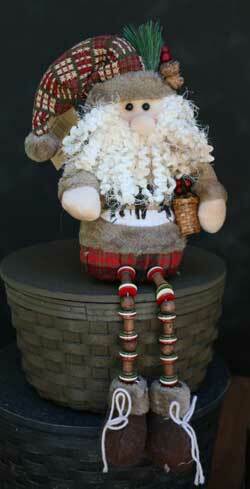 Stuffed figure in a woody brown and white color palette, with faux fir trim. This is for the SNOWMAN. Measures 8"W x 11"H x 7"D (inches). Made of fabric, faux fur, and resin eyes. Other stuffed figures also available! 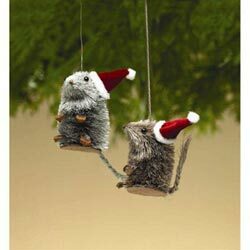 Grass Mouse Ornament with Hat, by Nutcracker Designs. 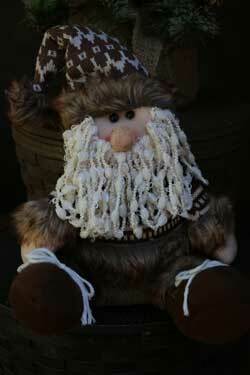 Adorable mouse ornament made with natural grass and wood, topped with a mini fabric santa hat. Sold individually - choose the Mouse on the Left (more grey) or the Right (more brown). Measures approx 2.5 inches. Photo courtesy of Nutcracker Designs. Hedgehog Figurine, by One Hundred 80 Degrees. 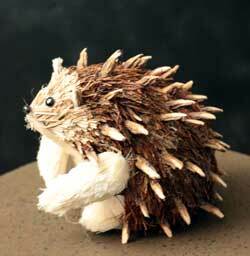 Darling woodland hedgehog figurine made of sisal and twigs. 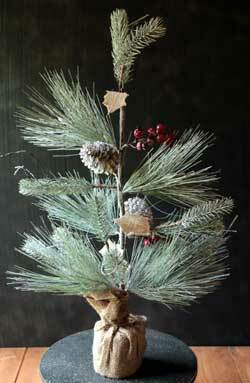 Nestle in to a holiday tree, use in a floral arrangement, or set on a shelf! Measures approx 6 x 6.5 x 5 inches.